Stories: whose words, whose pictures, whose property? My name’s Katie Webb. I live here in Shepherd’s Bush and I work in the field of authors’ rights. That is to say I work with authors to try to ensure that copyright, the system designed to ensure authors can make a living, works for them, to help them make a living from the use of their works. Journalism is a form of authorship – and so I’m going to think about journalists as authors in what I say this evening. I’ve done this work all over the world. My job was to create something called the International Authors Forum (www.internationalauthors.org), which brings together unions of writers and artists in different countries in order to represent the interests that they have in copyright – the legal right which protects their work, which saves it from being taken and used without asking, misattributed, or not attributed to its author (or enables the author to remain anonymous) and stops them from being exploited, so that somebody else makes money from their work when they aren’t given the opportunity to. It gives them a legal and financial framework for their work, so they can make sure that their work, in any medium, be that art, photographs, literature, music, reaches an audience and still enables them to make a living. To get by. Through the International Authors Forum, we try to connect authors in the world, as well as being a platform for authors. Not all authors can be connected easily with each other, or with their audience, albeit that the tools of communication are the tools of their trade. In an age where so much information, in particular in the form of words and pictures, gets to us on the internet, we tend not to pay for it as such. We can type in anything into a search engine and get lots of words and pictures for free. For example, these are the pictures I got when I typed ‘Iraq’ into the google image search two days ago. Who took these pictures? The connection between the author and their work – the work and its origin – is easily broken. Mouayad, an Iraqi photographer, wants to tell a different story about his home, Iraq, through his photographs. That is a story of a common heritage, of religious pluralism and overlapping identities, a story of history, of the earliest civilisations and languages. 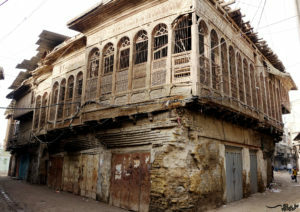 His photographs show three elements of Iraq today; historic Babylon; the marshes in the south of the country, home to people of the Sabean Mandean religion who still live according to ancient traditions and rituals; and the Torah houses in Baghdad, once home to the Jewish population who no longer live there. His photographs are united by the idea that we all need a place to live, somewhere to make our home, something to believe in. These photographs tell that story, making Iraq hospitable, habitable and accessible through photographs in a way that it cannot be physically to foreign visitors or even to people for whom it is home. 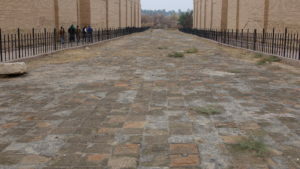 Like the Jewish population which has not inhabited Iraq since 1948 despite thousands of years of lineage there. Like Mouayad, who lives in Sweden in order to exercise his freedom of expression as an author, as a photographer; his human right. The unity between the three elements represented in his photography – the marshes, the Torah houses, Babylon – are all at risk of being lost – in some senses already have been. He keeps them alive by sharing his story through photography. He has to do so at risk, in another country that is not home. Yet he still cares. He wants people to know about his country through his photographs. Maybe if they don’t know much through the pictures alone, then he wants them to become curious. 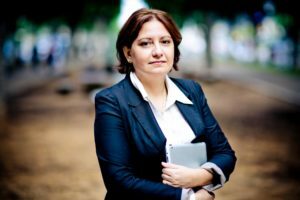 Vered, an Israeli educational entrepreneur and former journalist, has a social enterprise called Novel Rights (https://novelrights.org/about/novel-rights/) which works with the idea of the power of literature to address human rights issues. She connects the recorded decline in reading beyond that we find on our social media channels and news feeds, with a decline in empathy – our ability to understand the perspectives and feelings of others. We read so much in one sense, through our phones and numerous news sources. Vered believes that through really ‘reading’ though – engaging with novels and writing that seeks to explore the issues we are confronted with more thoughtfully, particularly those related to human rights issues – we can empathise and understand and learn how to help. Teaching people the skills to participate qualitatively in authorship, as Cinzia is doing through the Photojournalism Hub – to become authors and critics, rather than simply the consumers of information overload – be that through photography, writing, photojournalism, attentive reading – can inspire people to more active participation in the issues that the media brings to our attention: to help others in need. It can help people to view and read what appears on their screens with a more trained eye, to distinguish between when effort and research and imagination have gone into that information, and when something is what might be regarded as ‘fake news’, or just another photograph gone viral, taken out of context – disconnected from its author and their story. These are the qualities, the skills, the work, that copyright is designed to reward. Novel means new. Novel Rights seeks to find new ways to present those qualities in Novels-writing – which generate empathy rather than mere ‘compassion fatigue’ to its readers – in novel ways, using forms (stories on Instagram for example) and business models (social enterprise, which rewards creators by giving them an income from their work and enables them to keep on creating) that fit our technology dominant age, to bring understanding of the lives of others’ whose lives are different from our own. In building the International Authors Forum, it was easy to work in countries where copyright is already set up. Where we have the principle that you can write your ideas down or use them to create photographs and document things – say anything you like – and then, provided that somebody is willing to buy it, you can sell it, claim it as yours, be named as the author, share it with an audience. Make ends meet. Make a living. Although that position is increasingly threatened by the way content is shared so easily and globally online: think how piracy has and models like napster affected music. However, in order to be truly globally inclusive, we needed to learn about parts of the world where we can’t take copyright for granted. Copyright has its basis in human rights. It’s recognised in Article 27(2) of the Universal Declaration of Human Rights, which says that: “Everyone has the right to the protection of the moral and material interests resulting from any scientific, literary or artistic production of which he is the author.” ‘Moral’, we can take to mean the ability for the author to have a say over the way the work is used, in what context, and what is done to it, in what form it appears, whether it’s changed in the editorial process, and whether the author is happy with those changes. It is the author’s moral right to be named, or not to be named. ‘Material’ interests we can think about as being paid. The currency we all need to be able to buy food, shelter, for ourselves, for our families, to establish a home, to get by. Another human right is freedom of expression – a pretty important one for the work of artists, of writers, of journalists. It affects their work directly. It affects us all directly. It is what we can use to speak to each other. To tell each other about our lives. To learn about each other. To help understand different situations. So in trying to understand the kind of obstacles that authors face in the Middle East and North Africa Region, I connected with some of them. And it’s their work that I have been able to share with you today, even though, to share it with each other, they have to do so in a country that is not their home, in secret, at risk, anonymised. Without freedom of expression in the first place there is not much to base a copyright system upon, from which to build an industry through which we can share, celebrate and reward authors and what they do for us, the information they bring to us through journalism, through writing, through pictures. Copyright is about rewarding authors for their work and giving them a basis to negotiate the terms on which they grant access to it, as independent creators, allowing them to tell their stories. Giving them the tools to make a living, to make money, where money in our society is so necessary to keep our heads above water, albeit not the only thing we need to survive. Of course what the International Authors Forum also aims to bring to authors, in addition to the opportunity for an income, is a community. Building communities and quality relationships between people is valuable – not just through our phones, not just through the endless words and pictures on them, by uploading things to social media, but by doing the work it takes to really get to know each other and our fellow human beings and our communities. The Photojournalism Hub, by building these skills, can empower more people to tell more stories, to listen to more stories, and to do them both well.